Happy Friday everyone! Since it’s the end of the week, we’re continuing our look back at the fourth season of NBC’s Chuck with re-posts of reviews I wrote for YourHub last year. These “double-feature” reviews will continue to go up each Friday until the fifth (and final) season premiere on Friday, October 21st. Small alterations to the reviews have been made, but please keep in mind these were all written the night the episodes aired, so they may read as somewhat out of date (especially when I worry about the show getting cancelled, which didn’t happen). We continue today with episodes seven and eight, Chuck Versus the First Fight and Chuck Versus the Fear of Death. Chuck has too many wonderful qualities to list, but unpredictability has never been one of them. The show doesn’t often go for twists or surprise endings, and when it does, one can usually see them coming a mile away, like Steven Bartowski’s death in the season three finale. That’s okay—in fact, it’s always been a part of the show’s charm, but on the rare occasions that Chuck has pulled off a completely successful twist ending—“I know Kung Fu,” anyone?—those surprises rank among TV’s best. Tonight’s episode—the pinnacle of season four thus far and one of the series’ all-time best outings—mixed all the wonderful qualities Chuck typically exhibits with a quick succession of twists more shocking, powerful, and heart-wrenching than the show has ever pulled off before. Thanks to phenomenal character moments, action set pieces, and an astoundingly good turn by guest star Timothy Dalton, I loved every second of the first three quarters of the hour. Somewhere in the back of my mind, while I was laughing at Dalton’s performance, I thought “hmm, wouldn’t it be crazy if he were the bad guy?” But that couldn’t be possible. He was just too funny and likable to be the bad guy. Other than that, I was absolutely convinced we’d get the most predictable outcome—Mary Bartowski’s innocence. I was slightly disappointed that the episode seemed to be revealing Mary as a hero so quickly after last week’s installment hinted at a darker side, but I shrugged it off as nothing more than a mild concern. Then all hell broke loose. Mary wiped the Intersect from Chuck’s head, Dalton turned out to be Alexi Volkoff himself, and the dastardly duo restrained Chuck and Sarah and blew Orion’s secret base sky high. Oh. My. God. People ask me what constitutes an “A+” in my book. The last two acts of Chuck Versus the First Fight are the answer. Never has the show so effectively duped the audience—in fact, I’d say the writers used our knowledge of how the show ordinarily operates in order to lure viewers into a false sense of security before punching us repeatedly in the gut. Even now, my stomach still reels from the shocks the episode delivered. From the moment he was introduced, threatening to rip Chuck’s throat out with a plastic fork, Timothy Dalton was a classic guest star. 99% of the guests on Chuck are perfectly cast, but a few have taken a step further, integrating themselves so perfectly with the show’s cast and tone that it feels like they should have always been there. That’s the kind of perfection Dalton displayed tonight, and I’d say the only other Chuck guest to prove so instantly endearing was Scott Bakula as Papa B. Thanks in part to how expertly Dalton tossed himself into the role as Gregory Tuttle, Mary’s inept but lovable handler, this was one of the funniest episodes of the year. He was impossible not to love—so awesome, in fact, that I suspected, perhaps, he could be a bad guy. But not the bad guy. If Tuttle had turned out to be another henchman, that would have been a standard, run-of-the-mill twist. Instead, Tuttle turned out to be Volkoff himself, and I can safely say Chuck has never shocked me so much, thanks mostly to how expertly Dalton switched from funny to terrifying in a manner of seconds. It’ll be great, moving forward, to have him as the lead villain; the only comparable character I can think of would be Chevy Chase as Ted Roark in season two, but he wasn’t nearly this menacing. Then there’s Mary, still as much of an enigma as before. Linda Hamilton is, as I’ve previously stated, perfect in the role, and she continues to excel. This is a character whom we, like Chuck, desperately want to love, even when evidence to the contrary continues to pile up. So even though I knew it was possible she was a villain, I never gave the thought serious consideration. By the end, after she’d wiped Chuck’s brain of the Intersect and blown up her husband’s secret base, both Chuck and the audience had to accept Mary isn’t trustworthy. But then again, since she spared Chuck’s life, we can’t completely dismiss her. Is she just protecting her cover in an extreme way, or is she a merely a villain with affection for her children? Or maybe she is evil, and has an even bigger, more horrible plan in mind for her son. For once, Chuck has stumped me. The future is, for the time being, unpredictable. The amazing twists were so expertly acted, directed, and even scored—composer Tim Jones really brought his A-game tonight and, to help bring tears to our eyes, the song used when the house blew up also accompanied Steven’s death last year—that it’s impossible not to focus the majority of this review on them. After all, this was such a huge, game-changing episode that it felt more like a season finale, rather than episode seven of a twenty-four hour run. But there were so many other things to love, like the parallel arguments between Chuck/Sarah and Morgan/Casey. As usual, Morgan and Casey’s story was comic gold with a side of pathos; it’s hilarious that Morgan considers this their ‘first fight,’ but also touching to see how much both Morgan and Casey value the other’s friendship. Meanwhile, Chuck and Sarah’s fight brought the romantic angst back in full force. I know some fans are tired of this, but I wouldn’t have it any other way; Chuck and Sarah’s argument in the midst of the bank invasion was one of the highlights of the entire season, and yet another poignant piece of their relationship puzzle. --Spies named Tom and Jerry? I got the reference, but not the joke. Hmm. --It was very cool to see Morgan meet Mama B; I hadn’t thought that she would, of course, know Morgan, since he and Chuck have been lifelong friends. --Budgetary constraints stopped us from seeing Chuck and Tuttle’s (*ahem* Volkoff’s) skydive, which was too bad, but using the commercial break was a clever way to cover it up. --Dalton’s enthusiastic reference to Alias was funny no matter how you slice it, but I do wonder if the joke was a response to criticisms last year that Chuck was trying to turn itself into a copy of the J.J. Abrams cult classic; it wasn’t, and it didn’t, so I say this was a clean, witty rebuttal. --The cowardly cop in the bank was another joke that didn’t work; I didn’t even realize, at first, that it was supposed to be a joke, since the character was so out of tune with the tone of the scene. Good thing he only had two or three lines. Could there be anything on this good Earth more worthy of a total geek-out than Summer Glau on Chuck? Well, yes, actually, since this episode was a pretty big letdown, but Glau was nevertheless the best part of this unusually subpar Chuck outing. In the episode’s defense, last week’s masterpiece episode, Chuck Versus the First Fight, was a tough act to follow, and almost anything would feel slight in comparison. But instead of capitalizing on all the great cliffhangers First Fight left us with, Fear of Death spun its wheels with a derivative and altogether uninvolving spy story. Chuck has lost his ability to flash before, in two of the show’s best episodes, Chuck Versus the Beard and the two-part season three finale, Chuck Versus the Subway/Ring Part II. These episodes demonstrated not just the importance of the Intersect, but how it relates to Chuck’s psychology and relationships, and they did all of this so thoroughly that approaching the subject again feels tired. Fear of Death didn’t do anything new with the material—again, Sarah is the key to Chuck’s mental stability—and apart from a creepy performance by Richard Chamberlain, none of the spy antics were particularly funny or exciting. Daily Show correspondent Rob Riggle (Agent Rye) is the kind of actor you’d expect to mix well with Chuck’s world, but his performance was awkward and lacked chemistry with the main cast. The entire spy story was at worst a misfire, and at best filler to get us through to the next cliffhanger. 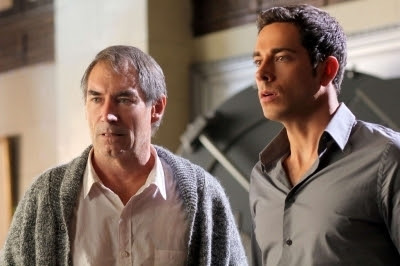 Thankfully, said cliffhanger was genuinely effective, and I suspect next week’s episode, wherein Sarah, Morgan, and Casey go rogue to save Chuck, will be a big improvement over what we saw here. As underwhelming as the main story was, the Buy-More subplots were surprisingly strong. Summer Glau is one of my favorite actresses, and this episode proved my long-standing theory that she’d be a perfect fit for Chuck. I would rather see her used as a major guest star in a multi-episode arc (NOTE from the present: she really, really, REALLY should have played Vivian Volkoff later in this season instead) but her “Greta” storyline was extremely funny and gave Jeff and Lester some of their best material of the year. The entire idea of rotating “Gretas” was pretty much dead on arrival at the beginning of the season, with a few inconsequential guest appearances that amounted to nothing more than some throwaway laughs. But tonight’s “Greta” story felt more like what the writers wanted out of this concept: take a talented/hot actress/actor, put them in a Buy More costume, and see how the employees react. With Glau in the role and going full “Cameron-from-Terminator” on Jeff and Lester, who in turn go into ultra-stalker mode, hilarity ensued. It’s not a classic sub-plot, but certainly an amusing one that gave Glau a good excuse to turn up on the show. It also tied into one of the few truly moving elements of the episode, Casey’s “cabin-fever.” At first, I thought this was just another “Casey-is-mad-without-violence” story, but it subtly turned into something more when Casey had lunch with Alex and revealed that he was worried the team might break up. That moment totally made my day—Casey, the super-soldier eager to leave Burbank just a few years ago, now has to admit he’s made such good friends he never wants to leave, and is willing to defend the integrity of his team to a more traditional agent like Greta. That is the Chuck I know and love; it’s just too bad the rest of the episode took the week off. I love this show enough that I can easily forgive the occasional misfire, but I’m a little worried that new writer Nicolas Wootton has penned the two worst episodes of the season so far—this and Chuck Versus the Cubic Z. The other new writers have integrated themselves into the show flawlessly, but Wootton’s scripts have underwhelmed me. Still, the season as a whole has not, so it’s not major cause for concern.